A Kenyan regional governor has been charged with terrorism and murder over attacks in the coastal Lamu district in which scores of people were killed. 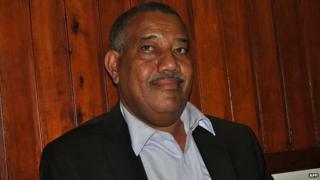 Issa Timamy was charged over the attacks on the Mpeketoni town area. He faces several charges including murder. Kenya's president has blamed the attacks on political networks, despite Somali Islamist group al-Shabab claiming responsibility. Opposition parties have dismissed the president's claims. Most of the dead were ethnic Kikuyus, like the Kenyan President Uhuru Kenyatta. Non-Muslims were singled out to be killed. Mr Timamy belongs to a political affiliate of Mr Kenyatta's governing Jubilee coalition. He will remain in police custody until 30 June, while investigations continue. The attacks earlier in June killed at least 60 people, as gunmen descended on hotels and a police station. It was the most deadly attack in Kenya since last September, when at least 67 people were killed by al-Shabab fighters at Nairobi's Westgate shopping centre. Governor Timamy is a high-profile politician, so the case has attracted much interest. Senior politicians from the coastal region accompanied him to court while supporters thronged the court precincts in a show of solidarity. The charges levelled against Mr Timamy are perhaps an indication of how serious the government wants to stick to its line - that local politics were behind the killings. But it is not clear why a politician affiliated to the ruling coalition would be the first target of arrests. Most of the people killed in the attacks were ethnic Kikuyus. Mr Timamy is an ethnic Bajuni, an indigenous group from Lamu County. Many of the native communities have had long-standing differences with members of the Kikuyu community, who they say came to the area and "took over their land". But whether this is a simmering dispute over land, or a terror attack by al-Shabab, this case will be a defining moment in the fight against terrorism in Kenya - and the fragile relationship of the communities in the area. Five people were killed in another attack on Tuesday by an armed gang on the village of Witu, about 15km (9 miles) from Mpeketoni. The following day the authorities said they had arrested 13 alleged separatists accused of planning more attacks on the coast. Lamu island is a well-known tourist resort. However, the attacks happened on the mainland, in Lamu County. Correspondents say there are long-standing political and ethnic divisions in the area around Mpeketoni, as well as disagreements over land ownership. Land disputes were behind much of the ethnic violence which broke out across Kenya after the disputed 2007 elections.